A new round of forecasts for the Miami, Florida real estate market suggest that home prices in the area will continue rising at a modest pace through 2019 and 2020. That’s for the mainland city. The Miami Beach housing market, on the other hand, has cooled considerably as buyers pull back. Note: This article has been divided into two parts to account for the significant differences between the mainland Miami real estate market and the Miami Beach housing scene. Home prices in the city of Miami have risen steadily over the past year or so. According to Zillow, the median home value in this real estate market was around $337,000, as of January 2019. That was an increase of around 5% from a year earlier. The broader Miami-Fort Lauderdale-West Palm Beach metropolitan area experienced a gain of around 8% during that same 12-month period. Looking forward, the company’s research team predicted that the median home value in Miami would rise by around 4.4% over the next year (through January 2020). 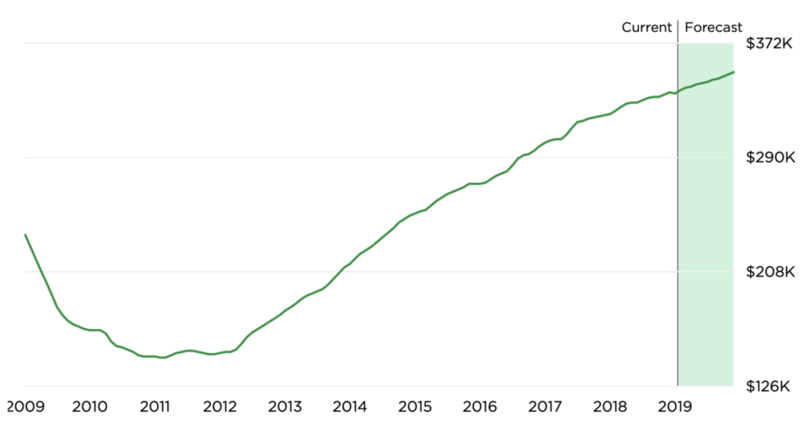 The chart below, courtesy of Zillow, shows how the median home price in Miami has changed over the past ten years or so. You can see where prices dipped following the Great Recession, and how they began a steady upward climb in 2012 — a rise that is still occurring. The green shaded area shows Zillow’s forecast for the Miami housing market through 2019 and into 2020. Chart: Miami home price trends. Source: Zillow. On the inventory side, there’s good news for buyers who are planning to purchase a home in Miami in 2019. There’s actually plenty of inventory across the metro area right now, when compared to a lot of other major U.S. cities. As of December 2018, Miami had about a 7-month supply of homes for sale. (That’s a theoretical measurement used to track real estate inventory levels over time.) A lot of other metro areas across the country have somewhere around a 3- to 4-month supply of homes for sale right now, and that’s below what is considered to be a “balanced” real estate market. So from a home-buying standpoint, Miami is actually better off than many other housing markets across the country. This reduces competition among buyers, while improving the chance that they can find a suitable property. On the demand side, population growth in Miami is bringing more buyers (and renters) into the local real estate market. According to the U.S. Census Bureau, the city’s population grew by 16% from 2010 to 2017. This and other factors have led to mostly positive forecasts for the Miami real estate market in 2019. Across the bridge in Miami Beach, it’s a very different scene. Due to a glut of housing inventory and a pullback of buyer demand, the Miami Beach real estate market could see a lower level of home-price appreciation in 2019. There has reportedly been a significant drop in buyer demand in this condo-heavy real estate market. A lot of the condo buyers in Miami Beach are from Latin American countries, where economic and political troubles are roiling. That’s partly why there are so many properties on the market in Miami Beach — and why a lot of them are just sitting there. In December of 2019, condos and other properties listed for sale in Miami Beach spent a median of more than 100 days on the market before going under contract. That was well above the national median of 50 days for that same month, and it indicates a sluggish real estate market. Disclaimer: This article contains forecasts and projections for the Miami, Florida housing market through 2019 and into 2020. Those predictions were provided by third parties not associated with the Home Buying Institute. We have gathered them here as an educational service to our readers.